We marketers like to believe that we "make" the customer do things. We believe that we cause customers to become "multi-channel", or that we "cross-sell" and "up-sell". On a small scale, yes, absolutely, it is possible to influence customer behavior. On a large scale, customer behavior is something that is nearly pre-determined, and is outside of our control. We can use Digital Profiles to understand how customers evolve and change over time. Click on the image above to enlarge it. Now read down the "Gold Mine Column". Here, you get to see what happens in 2010 to customers who were "Gold Mine" Digital Profile members in 2009. As we already know, 83% of these customers purchase again in the next twelve months. Just as interesting is the Digital Profile that the customer will belong to in the next twelve months. 33% of customers will be "Gold Mine", 8% will be "Multi-Channel Mavens", 8% will be "Retail Fanatics", with the remaining 34% distributing across the remaining 13 Digital Profiles. 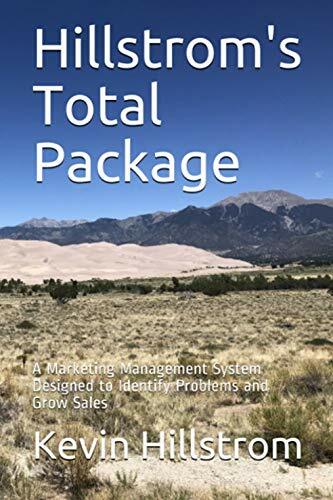 In other words, "Gold Mine" customers are not likely to stay in the "Gold Mine" profile, the move and evolve, but not terribly far from their original destination. Notice that 16% either become "Multi-Channel Mavens" or "Retail Fanatics", Digital Profiles that are congruent with the "Gold Mine" Digital Profile. Next, take a look at "Ship It To Me", a direct-channel-centric Digital Profile. Only 32% of these customers are likely to purchase in the next twelve months ... with half of those who repurchase migrating to "A Long Drive" or staying in "Ship It To Me". Clearly, these customers are not likely to be encouraged to become "multi-channel" buyers, and are not likely to become strong retail customers. Heck, why even bother with spending energy trying to get these customers to shop retail stores when it is not their natural pre-disposition! Let's look at one final Digital Profile ... "Retail Fanatics". 67% of these customers are likely to repurchase in the next twelve months. 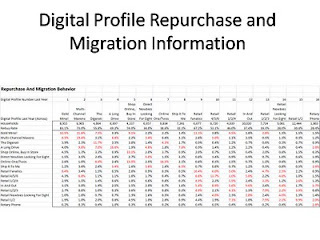 These customers do seem somewhat likely to migrate to other Digital Profiles, including "Retail Fanatics", "Retail 4/5/6", "Retail 1/2/4", "In And Out", and "Retail 1/2/3". This is not a good sign! In other words, the "Retail Fanatic" is not likely to become a "Multi-Channel Maven" or a "Gold Mine" shopper (these are Digital Profiles that exhibit retail and online behavior). Instead, these customers are likely to "drop down" to a lower-value Digital Profile, one that is retail-focused, one that prefers fewer (not more) merchandise divisions. 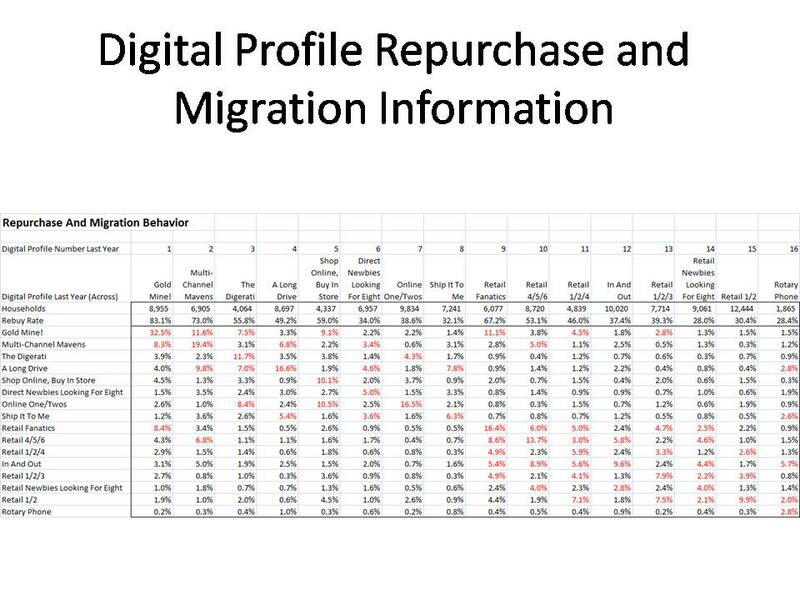 It has been my experience that you do not "force" a customer pre-disposed to stay within one channel to shop other channels (like the web) ... in this case, the majority of customers in this Digital Profile are going to stay in the retail channel. We use Digital Profiles to understand how customers behave and evolve, we seek to understand how we might better market to customers, given unique behaviors outlined in the "Digital Profile" framework!